Pleasant and helpful staff. On-site, coin-operated laundry. Nice, clean rooms. The rooms appear to have been recently and tastefully updated, which is always a plus. We did have to switch rooms due to a noise issue, and the second room was perfectly quiet. The breakfast was very good and the on-site restaurant was exceptional. All of the staff were cheerful and welcoming. Where to find Coos Bay hotels near an airport? Where can I find hotels in Coos Bay that are near tourist attractions? 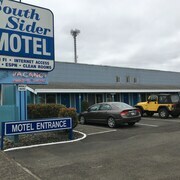 Hotel options are limited in Coos Bay. There are, however, 8 hotels and apartments within a 20-30 minute drive. 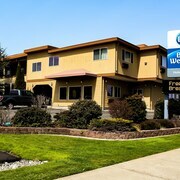 The nearest Expedia-listed hotel is the Best Western Holiday Hotel, Oregon, which is 9 kilometres (6 miles) from the middle of Coos Bay. Also, check out the Quality Inn & Suites at Coos Bay, located in Oregon, which is 11 kilometres (7 miles) away. The Plainview Motel & RV Park is situated 16 kilometres (10 miles) away from the central part of Coos Bay and is good for those who like to stretch their budget. 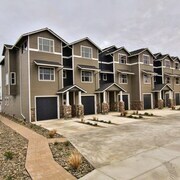 Another economical option here is the Super 8 Coos Bay/North Bend. You could investigate the Red Lion Hotel Coos Bay and also the Edgewater Inn. The Red Lion Hotel Coos Bay is positioned 10 kilometres (6 miles) away from the middle of Coos Bay. The Edgewater Inn, is 9 kilometres (6 miles) away. Two other hotel and apartment options here are the Motel 6 Coos Bay and the Captain John's Motel. Reedsport is located 40 kilometres (24 miles) to the southwest of Coos Bay. While here, be sure to enjoy the Bandon Dunes Golf Resort. Visitors looking for accommodation in Bandon have some great Expedia-listed options to choose from; the Best Western Inn At Face Rock and Lighthouse Cove Inn. Or, there's Reedsport, 35 kilometres (23 miles) to the north of Coos Bay. While in Reedsport, why not visit the Umpqua Discovery Center. 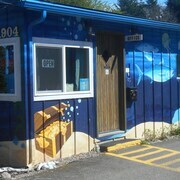 Room options in Reedsport include the Best Western Salbasgeon Inn & Suites Of Reedsport and Best Budget Inn. If you enjoy sports and really like games you might decide to visit Sand Master Park, which is 70 kilometres (44 miles) to the north of Coos Bay. Sports fans wishing to find a room or apartment close to the action can take their choice from the Driftwood Shores Resort And Conference Center or the Comfort Inn Florence. 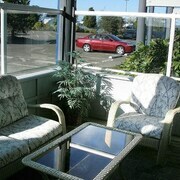 If you decide to fly into Coos Bay, Southwest Oregon Regional Airport is a convenient airport. It is 13 kilometres (8 miles) away. Bay Bridge Motel is nearby. What are the most popular Coos Bay hotels? Are there hotels in other cities near Coos Bay? 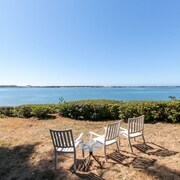 What other types of accommodations are available in Coos Bay? Explore Coos Bay with Expedia.ca’s Travel Guides to find the best flights, cars, holiday packages and more!